This article is about the quest. For the item, see Pantea's Flute (item). Find a missing flute for Pantea. Talk to Pantea at the Bards College. Travel to Hob's Fall Cave and find her missing flute. Return to Pantea for your reward. When the Fire Festival marks the end of the Tending the Flames quest, talking to Pantea will bring up the topic of a flute: "That damn fool! I should ring [sic] her neck!" When asked to elaborate she will explain about a foolish student, Larina, who stole Pantea's flute and sold it to a necromancer, who believed in Larina's story about the flute being able to make the dead dance. Pantea is understandably upset as the flute has been passed down through seventeen generations, so she asks you to retrieve it for her – right away. A map marker will now point you towards Hob's Fall Cave, a necromancer den northeast of Frostflow Lighthouse in the Winterhold region. While the cave itself seems straightforward, it has quite a few secrets worth exploring, so enter and take a look around. The ledge overlooking the first room is where you will return after a successful trek, so locate the icy path to the left and make your way through the tunnels and fight the hostile necromancers guarding the desk with a soul gem and a treasure chest. Proceed forward until you reach a suspension bridge. Look over the edge and notice the necromancer camp deep down below, with an alchemy lab and several bedrolls. Use the ledges to jump down for a surprise attack, then loot the camp for a rare unusual gem and a copy of the Restoration skill book The Exodus. Head back up, using the path to get back on track, and then fight the necromancers guarding the next room. Examine the arcane enchanter for a copy of the Enchanting skill book Enchanter's Primer, then activate the pull chain and either dodge or destroy the spellcaster traps. The final room is guarded by three necromancers and contains the chest with the flute, a black soul gem, and a locked cage containing a dead body. After taking the flute, jump down from the ledge and exit the cave the way you came in. Back in the Bards College, Pantea will be overwhelmed with joy and will teach you a few tricks she learned while playing for the Winterhold wizards, specifically a one-point boost to all your Magic skills, including Alteration, Conjuration, Destruction, Enchanting, Illusion, and Restoration. There is a copy of Boethiah's Proving on a bookshelf in the back of the room with the arcane enchanter. This book starts the Boethiah's Calling quest (Level 30 required). Isabelle Rolaine's corpse is found at the entrance of the cave for the quest Drowned Sorrows. Possible location for Helm of Winterhold from the quest Dungeon Delving will be in the same chest as the flute. 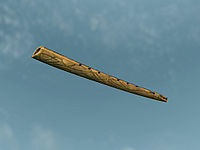 The flute can be found before the quest is given, meaning the marker to turn the quest in never appears, nor will Pantea even offer the quest. After you turn in the quest, the flute will remain in your inventory, still marked as a quest item. It's possible that you can turn in the flute to Pantea but the quest won't complete. Upon finding the flute before accepting Pantea's quest, the said quest to find the flute will stay in the active state once it has begun, even though the flute is already in the player's inventory, preventing the player from completing the quest. ? On the PC, it is possible to use the console to advance through the quest by entering setstage BardsCollegeFlute stage, where stage is the number of the stage you wish to complete. It is not possible to un-complete (i.e. go back) quest stages, but it is possible to clear all stages of the quest using resetquest BardsCollegeFlute. This page was last modified on 7 March 2017, at 20:12.